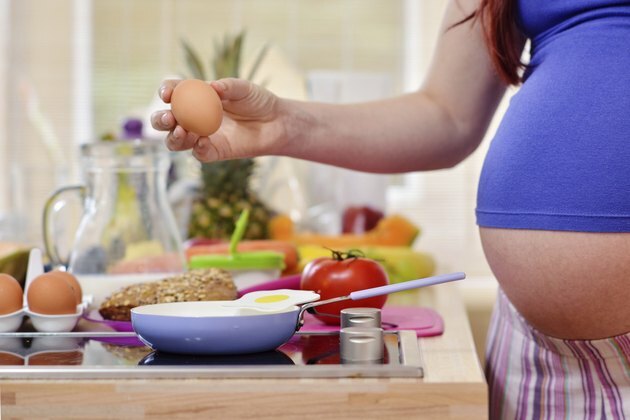 Maintaining optimal nutrition throughout your pregnancy is vital. Not only does your baby need an abundant supply of vitamins, minerals and other nutrients to develop properly, you also require additional nutritional support to prepare you for labor, delivery, nursing and motherhood. Although a balanced diet is the most critical component of good nutrition, most pregnant women supplement their diet with prenatal vitamins. These extra nutrients are especially important for women whose dietary intake is limited by morning sickness or who aren’t in the habit of eating healthy foods. Folic acid, a B vitamin, is present in dark green, leafy vegetables. Folate deficiency during pregnancy is associated with low birth-weight infants, miscarriage, orofacial deformities such as cleft lip or palate, fetal heart anomalies and neural tube defects, which are openings in the brain or spinal canal that occur early in fetal development. According to a 2005 article in “American Family Physician,” you should begin daily supplementation with 600 mcg, or 0.6 mg, of folate one month before conception, but taking 4 mg daily as soon as you discover you are pregnant is nearly as effective. Bone and muscle development in your baby requires calcium, a mineral found in meats, dairy products, leafy green vegetables and legumes. A 2009 review in “Current Osteoporosis Reports” suggests that fetuses who receive too little calcium during development are at increased risk for osteoporosis later in life. Furthermore, insufficient calcium intake during pregnancy increases your risk for pregnancy-induced hypertension, or preeclampsia, which increases the risk of death for both mothers and infants. Recommended daily calcium intake is 1,000 to 1,300 mg.
Iron, a mineral found in red meat, fish, poultry and a variety of plant foods, is needed for the development of normal red blood cells. Insufficient iron intake during pregnancy contributes to both maternal and fetal anemia, which in turn can lead to premature delivery and low-birth-weight infants. Anemic mothers have more fatigue both before and after delivery, and anemia can complicate delivery by necessitating transfusions for both mother and infant to treat relatively small blood losses. Recommended iron intake during pregnancy is 30 mg daily. Vitamin D, the “sunshine vitamin,” is required for proper calcium metabolism. Vitamin D also has a role in immune modulation and other physiologic functions. Vitamin D deficiency during pregnancy can lead to critically low blood calcium levels in newborn infants and contribute to osteomalacia, or weak bones, in affected women. Because high doses of vitamin D can lead to toxicity, current recommendations are for a relatively low daily allowance of 200 IU during pregnancy. These recommendations are undergoing reevaluation, however, in response to evidence of widespread vitamin D deficiency among young adults. Ask your physician what dose is best for you. Deficiency of vitamin A is rare in developed countries, but according to Dr. Stephen McGowan at the University of Iowa, it is the second-leading cause of blindness in children living in third-world nations. People in industrialized countries usually obtain vitamin A from dietary sources, so limit your total intake during pregnancy to 5,000 IU daily. Prenatal vitamins contain a host of nutrients, including a full array of vitamins, minerals and trace elements. The doses for most of these nutrients have been adjusted to meet the needs of pregnant and nursing mothers. Although you can obtain adequate prenatal nutrition with a balanced diet, many women simply do not adhere to one. If you are pregnant, you should talk with your doctor about whether you would benefit from taking a prenatal vitamin.